Fits all T-posts, 3/4" diameter sucker rods & 1 1/8" wide U-posts. T posts, steel - small, medium & large, with or without studs. T posts, fiberglass - medium & large sizes only. Sucker rods - 3/4" diameter only. U posts - small, 11/8" wide. Backside only. Small garden U posts—11/8" wide. 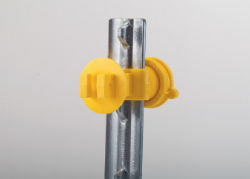 Insulator opens to attach anywhere on post.